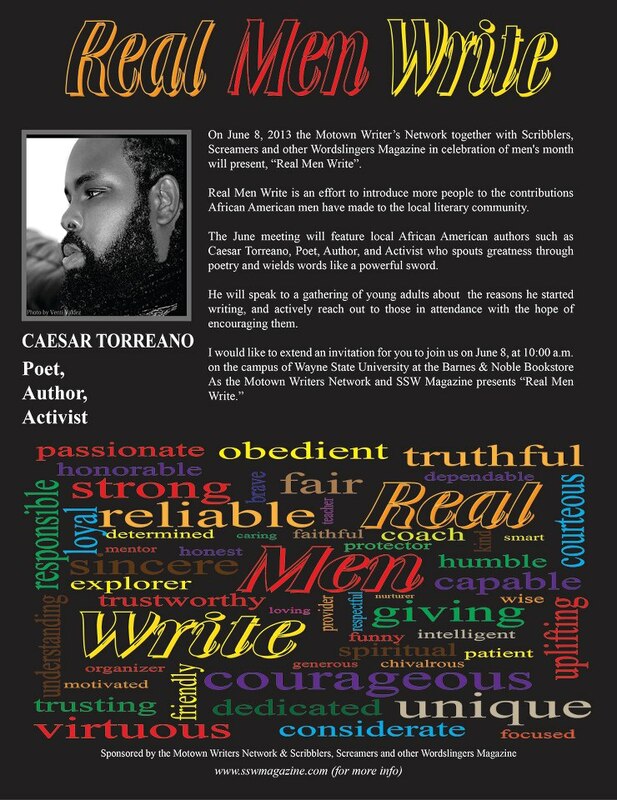 On June 8, 2013 the Motown Writer’s Network together with Scribblers, Screamers and other Wordslingers Magazine in celebration of men’s month will present, “Real Men Write”. 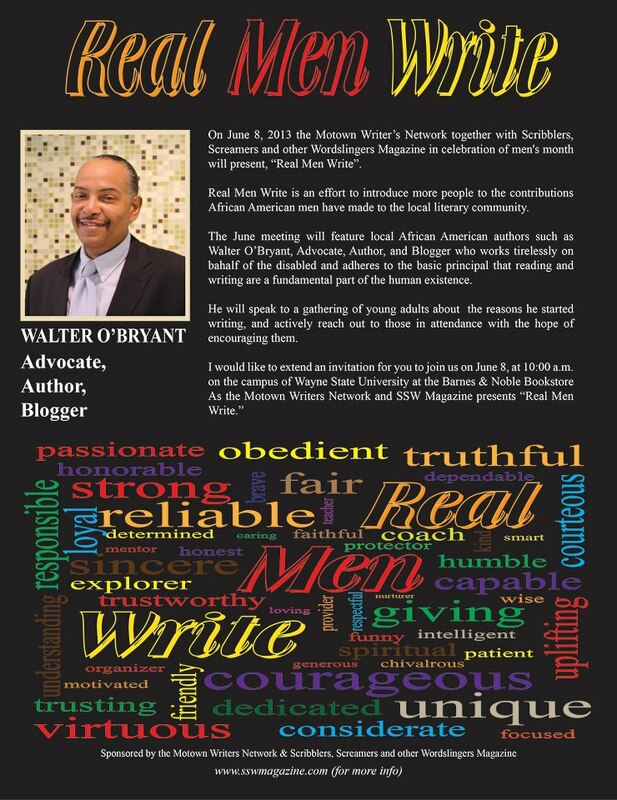 Real Men Write is an effort to introduce more people to the contributions African American men have made to the local literary community. 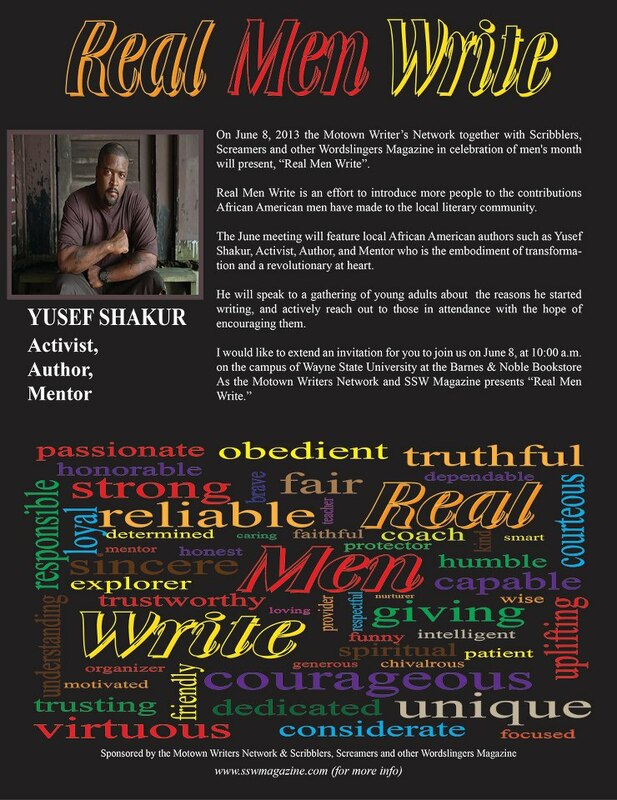 The June meeting will feature approximately six local African American male authors who will speak to a gathering of young adults about their books. 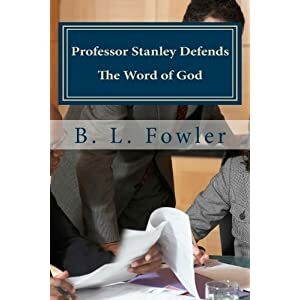 They will give insight into the reasons they started writing, and actively reach out to those in attendance with the hope of encouraging them to follow in their footsteps. As the chairperson to the 8th Annual Essence of Motown Literary Jam, this year was a wonderful year packed with excitement and fun for me. I usually don’t get to enjoy my conferences or events because I’m so busy putting out fires, running here, helping here, organizing this and so forth. Yet, this year, the group of volunteers, assistants and facilitators made my job so easy to the point that I found myself actually with free time to watch people enjoy the day. I want to thank a lot of people who made it possible. Especially our sponsors. Now there were handouts some of you didn’t receive or resources that you requested online. Please use this post as your way to write and evaluation in the comments and subscribe for updates for more information! thanks! Here’s the first set of photographs from the conference from our official photographer, Jwyenza Michael Collins. You’d love him at your event so contact him to arrange for photographs to be taken at your event. Contact him at: upstartwriter@gmail.com. I also want to thank Jason Lawson for taping the Literacy Panel and Keith for the audio. If you need any of their contact information, please let me know. They’re wonderful and you would love to have them help document your events, do productions and more! Also supporters like Thrive Detroit, Ebooks2go.net, Fitness USA, Marriage Center of Michigan, Marshalle Montgomery, HollaIfYouHearMe.com, Obama Campaign 2012, Congressman Hasan Clarke, and many many others. My thanks to Sylvia Hubbard and Motown Writers Network for inviting me to a great panel discussion! I really enjoyed myself @ the Essence of Motown Literary Conference w/ @Kaiology @sylviahubbard1 @Holla_KGreene @bkeithlowe. I luv my life! 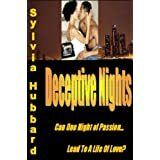 @sylviahubbard1 Thanks again for putting on a powerful Conf. 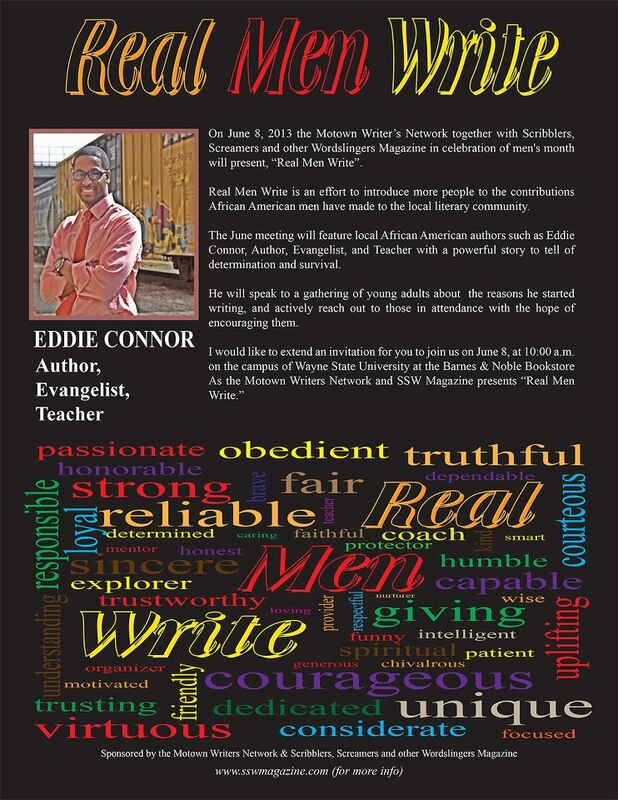 for the city of Detroit…honored to be 1 of the Bros. on the literacy panel! I should also thank Detroit Poetry Blog for their support in the panel discussion. Victor Walker sending kisses of love for so much you’ve done. We also had a write-in going on and there was time for all the vendors and authors to get up and speak. Thanks Octavia Lesley for coordinating the open mic on Saturday and thanks Kelly Green for handling open mic on Friday. Venus Mason Theus, you are the bomb for the wonderful write in you organized on the go for us and we will be doing this again in June (The write in, not the conference. That’s not until next year). I want to apologize in advance for anything I’ve forgotten. A lot of people really don’t know how much work goes into making this conference work. Again I’d like thank the wonderful volunteers for making this happen! I also want to thank and let the community know how much I appreciate your support. We’re still collecting books for our book drive. You can drop them off from 11am to 4pm at The Detroit Impact Center 9930 Greenfield, Detroit, MI 48227. Call in advance to be sure at 313.272.0004. If you’d like to become a sponsor in advance, let’s do this. Contact our Advertisement and Sponsor coordinator, Kai Mann who’ll definitely help you out to support the Michigan Literary Network! 2012 is going to be a great year for Motown Writers Network and if you’d like to help us out, please do so by contacting us! There’s no Network without you, so I’ll be happy to hear from you! 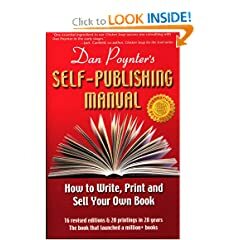 2012 Writer’s Market Deluxe Edition – Get yr copy now! Subscribe to The Michigan Literary Network for updates! Know someone who is unemployed? Tell them about this conference! Is There A God Idea For You? MWN Authorpreneur Program – From Publishing to Success! 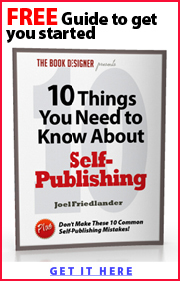 Do you have a writer’s resource must have? Contact Us! Link: Heavy D’s Death | Flipside Ink! Link: Dying To Be Grown | Flipside Ink! Bring only poems you’ve just written or never read before TONIGHT! 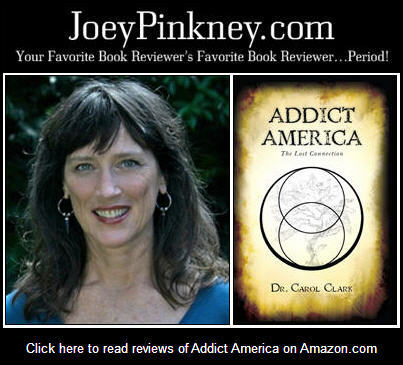 Often, poets read the pieces that are more popular or get the most attention and feedback. In those cases, poets feel that they are somehow expected to please their “audience” by recycling those poems every week. I am no stranger to this phenomenon. I can also admit that there are some folks that don’t even come hang out in the venue because they refuse to pay to hear the same poets read the same poems. So, what did we do about it? We bit off of the Columbus, Ohio series Writer’s Block (thank goodness President Scott Woods and I love each other). They run an event called first draft open mic. We’ll be running once each month The Raw Uncut, First Edit Open Mic. Bring new or “new to us” pieces tonight. Keep those popular pieces at home. Don’t get mic pulled, Playa. I am really looking forward to this week’s open mic! Once a month, on a Feature Free week, I’d like to turn our open-mic into a space where first poems can be read. I’m sending a shout out to our Writer’s Block family in Columbus, Ohio for starting the First Draft Open Mic. They told us if we changed the name, we could enact the same event in Detroit. Our event will be called “The Raw Uncut, First Edit Open Mic”!… Bring your first drafts and/or poems you’ve NEVER read to an audience before on the Cliff Bells stage. If we’ve heard your poem before, your mic will be cut. No restrictions on topics, it just has to be new to us. Bring 2-3 pieces to share! This event encourages writing/reading newer work. Come hang! Go South on Woodward (towards downtown) to Elizabeth W. (near the Fillmore/State Bar), make a right. Take to Park (first street) make a left and park your car!! ByteThis Poetry Series is an Official Poetry Slam, Incorporated Venue. 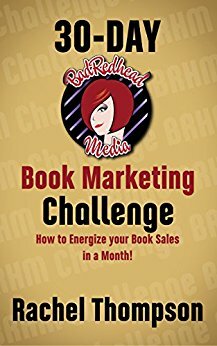 HAVE A STORY IDEA? Pitch it before a live studio audience! Teen Hype hiring peer educators! : ByteThis Poetry and Slam Series welcomes our new Dinner Menu + YOU! “Detroit Reads!” on Friday, August 28 at 8:00am. Each week Loving Healing Press and Reader Views bring insightful interviews from people around the world who can help you get your work published, and if already published, noticed! See Pam Perry at http://www.ardyssintl.blogspot.com or contact me thru http://www.drop3sizes.com/pamperry (join the Dream Team – Women Enterprising Network) It’s hot! ONLINE CONFERENCEAugust 23-29, 2009 Registration If you want to win prizes, please take a moment to register, that way I have your address and can send your prizes off next week. REGISTER HERE If you haven’t received the welcome letter, please let me know. Huge Storewide Stock-Up Sale!! August 2009 Our Biggest Sale EVER…One Week Only: Sunday, Aug. 23rd Through Sat., Aug. 29th It’s Open to Everyone, But YOU Get To Hear About It First! Greetings! 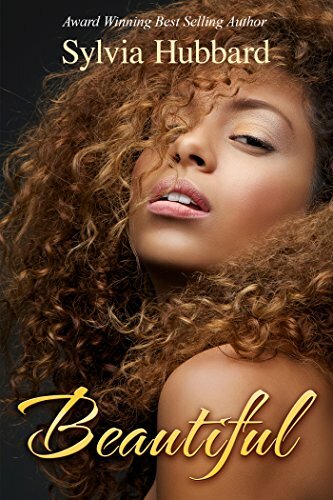 Fw: Fiction Friday: Last Woman Standing – Tia McCollors! 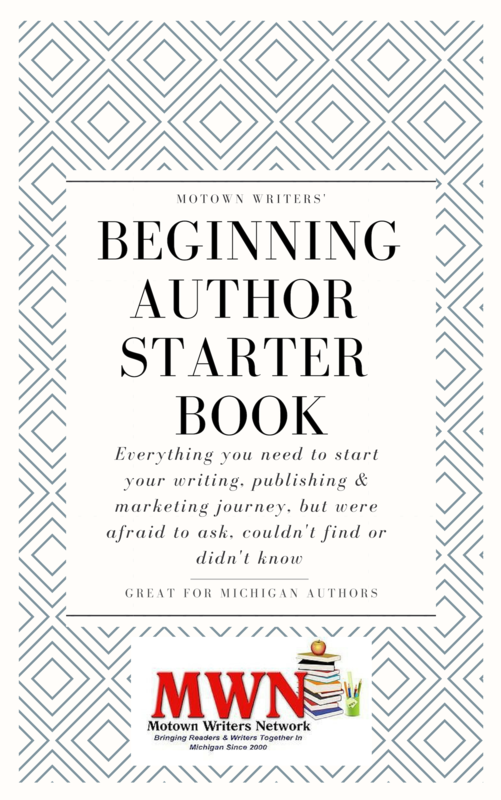 Strengthen Michigan’s Literary Community: Link to Motown Writers Network! This Saturday can be a new start to the rest of your life and business! If you missed our meet and greet, check out our video archives at Youtube.com. 2009 6th Annual Essence of Motown Literary Meet &Greet Detroit authors, poets and community leaders speak at our literary event in Detroit on August 8, 2009 @ Barnes and Nobles Bookstores! See ya Next year! 2009 6th Annual Essence of Motown Literary Meet &Greet Detroit. -Author, Paula Tutman speak at our literary event in Detroit on August 8, 2009 @ Barnes and Nobles Bookstores! See ya Next year! 2009 6th Annual Essence of Motown Literary Meet &Greet Detroit. 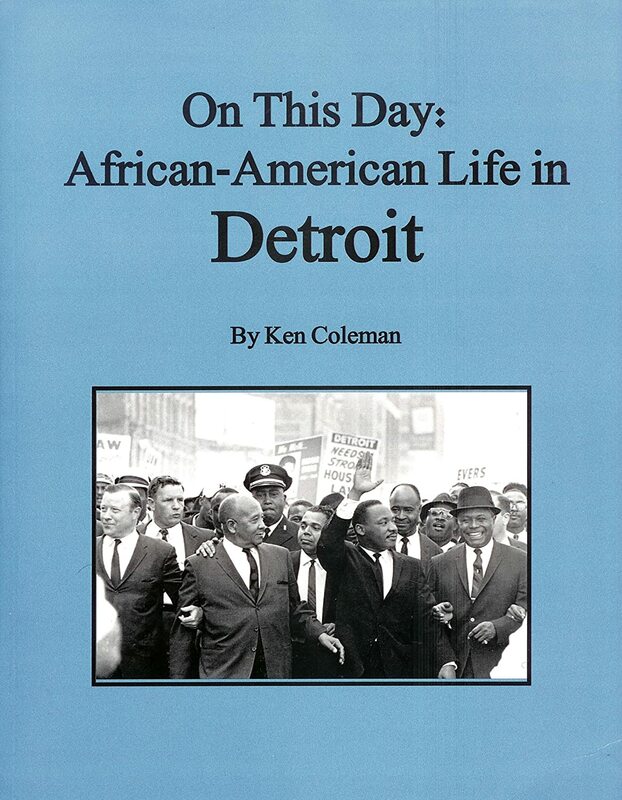 Author, Keith Gaston speak at our literary event in Detroit on August 8, 2009 @ Barnes and Nobles Bookstores! See ya Next year! 2009 6th Annual Essence of Motown Literary Meet &Greet Detroit. Author, Monica Marie Jones speak at our literary event in Detroit on August 8, 2009 @ Barnes and Nobles Bookstores! See ya Next year! 2009 6th Annual Essence of Motown Literary Meet &Greet Detroit. 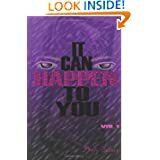 Author, Monique Menash, of Who Is He To You? 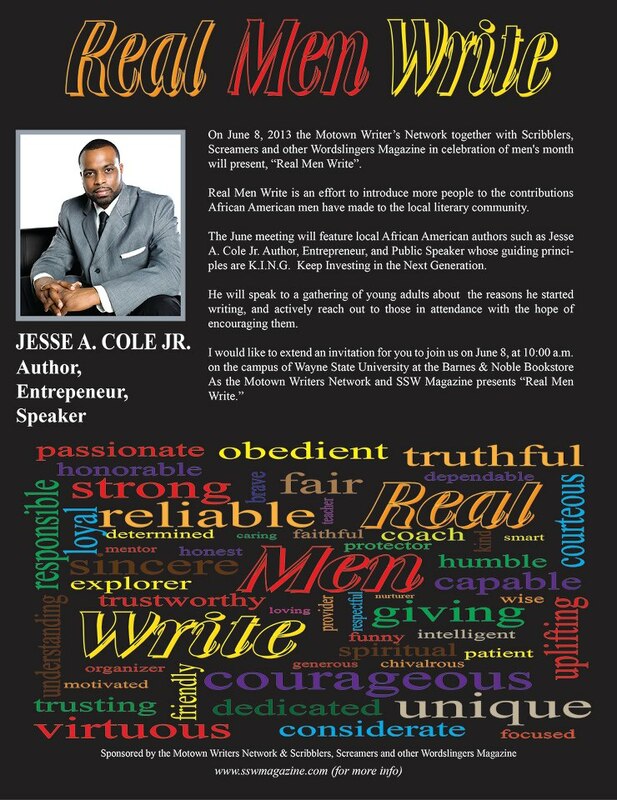 speak at our literary event in Detroit on August 8, 2009 @ Barnes and Nobles Bookstores! See ya Next year! 2009 6th Annual Essence of Motown Literary Meet &Greet Detroit. Author, Cheryl Pope of Princess Zaria series speak at our literary event in Detroit on August 8, 2009 @ Barnes and Nobles Bookstores! See ya Next year! 2009 6th Annual Essence of Motown Literary Meet &Greet Detroit. Author, Gwen Cannon speak at our literary event in Detroit on August 8, 2009 @ Barnes and Nobles Bookstores! See ya Next year! 2009 6th Annual Essence of Motown Literary Meet &Greet Detroit. Author, D Marshall of Karonteon speaks at our literary event in Detroit on August 8, 2009 @ Barnes and Nobles Bookstores! See ya Next year! Tony Adams giving our conclusion video thanks @ 2009 6th Annual Essence of Motown Literary Meet &Greet Detroit authors, poets and community leaders speak at our literary event in Detroit on August 8, 2009 @ Barnes and Nobles Bookstores! See ya Next year! REGISTER FOR OUR NEXT EVENT!!! 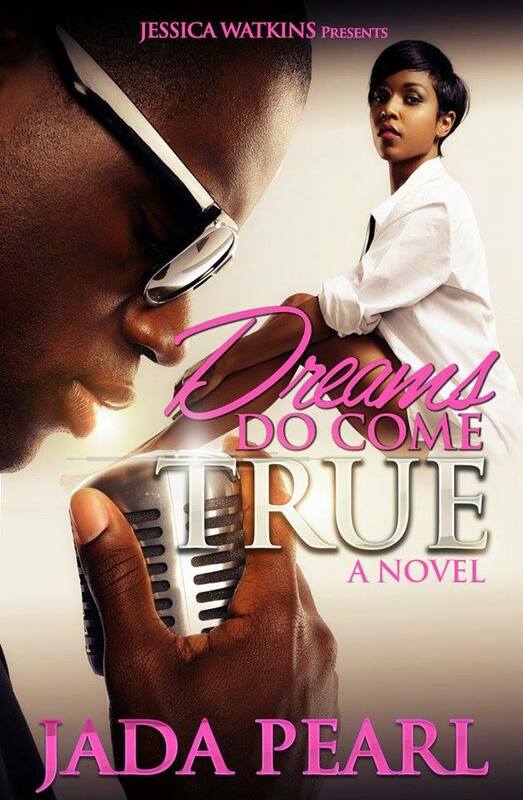 “WHO IS HE TO YOU Virtual Book Release Party ” Tonight on Blogtalkradio! Event: August 29, 2009 Author, Adra Young & POSITIVE Sisters!